Thomaston City Hall is located at 106 East Lee Street, Thomaston, GA 30286; phone: 706-647-4242. Photo: Sydney Barren House, ca. 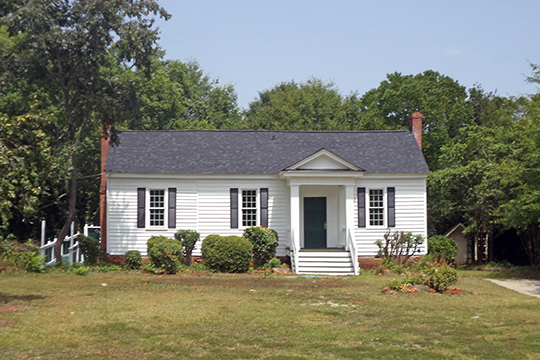 1920, 505 Stewart Avenue, Thomaston, GA. Listed on the National Register of Historic Places in 1994. Photographed by User:Michael Rivera (own work), 2014, [cc-by-3.0 (creativecommons.org/licenses/by/3.0)], via Wikimedia Commons, accessed October, 2015. The City of Thomaston was incorporated in 1825 and made the County seat Upson. The town was named for General Jett Thomas, famous in the war of 1812. There was a large influx of settlers into the area before Upson County was created from Monroe County, a portion of Pike County, and a small section of Crawford County in 1824. An even greater number came following the division of the land into lots that were distributed among the citizens of Georgia to quickly settle the newly acquired lands. The first census of Upson County in 1830 showed a population of 7,013. By 1860, the total had reached 10,172, being almost equally divided between whites and blacks. The settlers of Thomaston came from the eastern counties of Georgia between the Oconee River and Augusta. Many were wealthy and cultured plantation owners who owned many slaves. They were seeking new lands to establish new plantations, largely for growing cotton as they had exhausted the fertility of their original land holdings. There were the people that settled the eastern section of Upson County, around The Rock, on Logtown Road, and along the banks of the Flint River. Quite a number also came from North and South Carolina, and a sizable colony came from New England to engage in textile manufacturing. The first cotton mill in Upson County was built on Tobler Creek in 1833 and called the Franklin Factory. A total of four textile mills, all water-powered, were built in the County prior to the Civil War, making Upson the center of the textile industry in Middle Georgia. Thomaston Mills was a major employer in the County from its beginning in 1899 until 2000, when the company declared bankruptcy. Martha Mills, a manufacturer of tire cord fabric, began operation in 1927 and continues to be a large employer (Martha Mills was bought by B. F. Goodrich, later WesTek, in 1929). In the 1920s, the peach industry thrived in Upson County, but peaches all but vanished in the County with the onset of the Great Depression in the 1930s, as orchard laborers found work in the mills. Peach orchards were cut down to make room for timber stands. McIntosh Trail Regional Development Center, 2007-2027 Comprehensive Plan—Upson County, The City of Thomaston and the Town of Yatesville, 2008, www.dca.state.ga.us, accessed October, 2015.